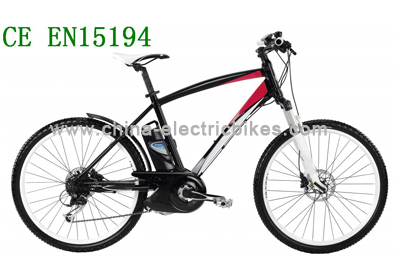 The fast electric mountain bikes comes with Shimano Nexus 3 speed gears ,pedaling to take you up to any hills. The braking system includes brake, brake handle, brake lines. Mountain bike in two brakes: [V brake], [disc], while the ordinary bicycle [hanging brake] is not common. V brake: with great force, because it is by friction wheel braking, so be sure to adjust the wheels in place, and not easily deformed. Disc: Compared to V brake, but not easy to tire locking, high speed, when locking is very dangerous and can lead to skidding and rollovers. Disc is very expensive, a good point in the thousand or so, V brakes 400 yuan can buy a pretty good. Disc two types: hydraulic disc brakes and mechanical disc brakes, hydraulic disc brakes rely on oil pressure to get huge braking force, the brakes in downhill fast electric mountain bikes is very common; cable pull disc brakes rely on finger power to brake, in fact, used in the XC more than sufficient. V brake can be divided into two types: V brake hydraulic and mechanical V brake, press the brake pads, and two disc brakes were the same principle. Just not very common hydraulic V brakes, locking up too easily, so almost no car use, but 09 is a GIANT ATX850 with hydraulic V brake.